By batting for "sweeping powers" for the National Investigation Agency, Governor NN Vohra has stirred up a hornet's nest in Jammu and Kashmir. That too when the restive state is without an elected government. Not unexpectedly, Vohra's proposal has drawn strong reactions from legal experts, human rights defenders and politicians. On 19 January, Vohra said he favoured bringing the Ranbir Penal Code, the state's criminal law code, under the purview of the NIA Act, 2008 so that the federal investigating agency is granted "sweeping powers to investigate any case within India". Delivering the keynote address on the seventh NIA Day, Vohra was speaking in the backdrop of recent major attacks in Pathankot and Gurdaspur. He said if the Gurdaspur attack had been "properly investigated", the strike in Pathankot would have been "almost impossible because we would have been able to know the routes taken by the terrorist groups to infiltrate the IB". What do legal experts say? The governor's statement drew almost instant condemnation, with top legal experts saying it would have "serious political implications". Senior advocate Zaffar Shah said investigating crimes is under the state's jurisdiction and bringing in the NIA would only "destroy the equilibrium between the state and the Centre". "What you are indirectly saying is that you don't trust the state's investigating agencies anymore. The tendency to centralise everything will destroy the fine balance between the state and Centre," he told Catch. Shah clarified that the NIA could be involved if any "particular offence" was beyond the state's capability to investigate. "But that too would require a nod from the state government. Because law and order is a state subject," he said. 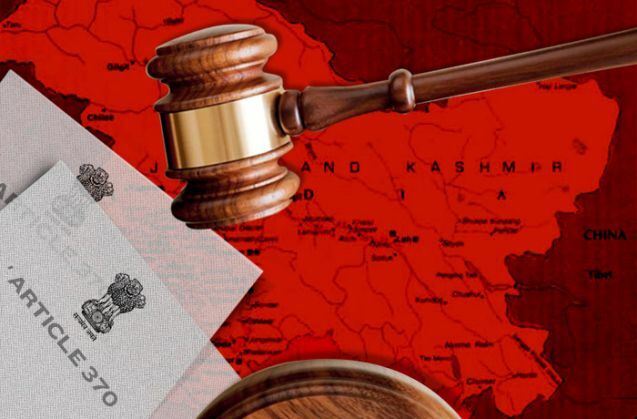 The experts contend that because of J&K's special status within the Indian union by virtue of Article 370, even the parliament does not have the power to enact or implement constitutional provisions without the concurrence of the state. Prof Sheikh Showkat Hussain, who teaches law at the Central University of Kashmir, said as the state's constitutional head, Vohra should have avoided making a "political statement". "Such issues should be debated by lawmakers in the Legislative Assembly. Vohra is a constitutional head, not a politician," he said. "Once lawmakers pass a law, the governor has to only sign it. That is his job. Making political statements that have serious ramifications is not what he's supposed to do." Another Kashmir-based legal expert, who did not want to be named, told Catch that "Governor Vohra is giving an impression of a dictator who wields unquestionable power to take autocratic decisions in a supposedly democratic set-up." "The state's autonomy stands eroded already. By favouring sweeping powers for the NIA, you're only complicating things in a sensitive region like J&K," the expert said. Kashmir's pro-Azadi leadership too reacted strongly to Vohra's statement. Mirwaiz Umar Farooq, the head of one of the two Hurriyat factions, said it should serve as an "eye-opener" for the pro-India parties which swear by their "autonomy" and "self-rule" slogans. "Well, bringing the RPC under the purview of the NIA appears to be yet another strategy to dilute powers of the J&K Legislative Assembly. In the context of J&K's so-called autonomous character, this latest statement of the governor should serve as an eye-opener for the National Conference and the PDP," he said. He said claimed that India was "trying its best to dilute the state laws" and "manage the Kashmir conflict under the garb of national security". A top security expert in Kashmir, however, told Catch that the NIA was already investigating cases in the state and that it can "come in" whenever any suspect is arrested under the Unlawful Activities (Prevention) Act of 1967. "For us, it doesn't make any difference. Already, several central agencies are working in J&K, which include the army and the CRPF," the expert said. However, he too cautioned against letting the NIA investigate matters under the RPC. "Though there's little difference between the Indian Penal Code and the RPC, but in legal issues, the language matters," he said. He added that the NIA was already investigating more than 10 suspects from J&K who have been arrested under the Unlawful Activities (Prevention) Act. Apart from the NIA, the Central Bureau of Investigation is allowed to probe cases in J&K when the state government so chooses. The agency was tasked, for example, to probe the killing of five innocent labourers from Pathribal in south Kashmir in 2000. It found several army personnel guilty of staging the five men's encounter and branding them as "foreign mercenaries". The guilty soldiers though escaped punishment as the army enjoys impunity under the draconian Armed Forces Special Powers Act. The NIA Act was passed by the parliament on 31 December 2008, not long after the Mumbai attacks, to establish a federal agency that would primarily, "counter terrorism". By virtue of this law, the NIA is empowered to investigate terrorism-related crimes without permission from the states, except J&K, which has a unique constitutional relationship with the Indian Union. It is the only state with its own constitution, flag, and national song. Also, unlike other states, only permanent residents can buy land and property in J&K. It's largely because Vohra's proposal could endanger this unique status of J&K that they irked many in Kashmir.